I don’t know about you, but in our house, the mortgage payments cover every nook and cranny inside the house and the space within our exterior property lines. Therefore, our philosophy is that we have no rooms that are just for show. Our house is fully utilized, as it should be. Anyplace that’s not actual living space is a potential storage area. At this very moment, we have at least one major storage area that requires a marathon semi-annual cleaning effort that can last up to two days – with all hands on deck. Seeing as though Christmas is less than 48 hours away, there’s no time like the present to begin Operation DPR to make room for soon-to-be exchanged gifts. What is operation DPR? Operation DPR is the process of sorting the contents of our storage/laundry room/crawl space into piles in order to spruce up our home a bit. During Operation DPR, items receive one of three labels: Donate, Purge, or Relocate. The donate pile is one of my favorites, because those items find new homes via our donations to Goodwill or some other chartitable organization. This pile can include anything from children’s clothing, to toys, to furniture. I love that someone else gets to enjoy things that we can no longer use, but are still in good condition. The purge pile is self-explanatory; these things are suitable for the trash. One man’s trash isn’t always someone else’s treasure. Then again, we’ve watched as passersby have sifted through our trash placed at the curbside on numerous occasions and driven away with a car full of our junk. Hmm, I guess this is a donate pile of sorts as well if someone gets to it before the waste removal company does. The relocate pile is for items that need to be buried deeper into the storage area, because while they have no immediate use, the cost of replacing such items, or their perceived future value, dictates that we hold on to them for a little longer. After all, you can’t predict when you’ll find a reason to repurpose something. Maybe I just watch too much HGTV. Or maybe I don’t watch it enough??? Once the piles have been processed, our newly-organized space will perhaps inspire me to do laundry regulary. A girl and her family can dream, right? To keep from having to go through this process more than twice per year and to help keep our space organized, here are a few simple guidelines that we’ve used. Donate, relocate, and purge at least twice per year. Garages are for cars. If we have so much stuff that we need to move our cars out of their houses to make room for an abundance of goods, we’ve accumulated too many things. Invest in a shed (or two as we have) for items that belong outdoors: bikes, lawn equipment, and summer sporting goods. Keep piles at appropriate heights. Storing too much on the floor makes a room look cluttered. While stacking things too high makes the room look small and dark; not to mention, it makes reaching items a sometimes dangerous feat. Resist – if you see a “perfect” coffee table, but already have one that perfectly suits your home’s current decor, resist the urge to buy it and there will be no need to store the other one. I know. I know. “But it was so cute and the price was right.” Remember? Resist. Use durable, plastic underbed storage boxes for kid toys, such as Legos and dolls and their accessories. Despite our philosophy, there’s always room for improvement, so for us, one thing that we can do to make Operation DPR a greater success is to schedule it. That’s right. We need to actually put it on the family calendar (we use Cozi), so that everyone will know exactly when Operation DPR will occur and prepare accordingly. It wouldn’t hurt to post a message on the frequently-visited refrigerator either as the date draws near. There’s nothing like a good cleaning project to bring new life to your living (and storage) spaces. Who will join me for Operation DPR? Share your DPR tips and before and after pictures (if you dare) on our Facebook page. P.S. 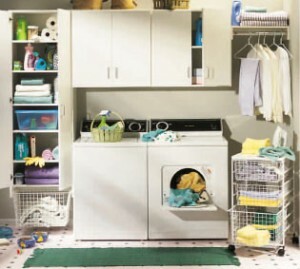 – The picture above is not of my laundry room, but it inspires me.